We would like to share a study on film festivals conducted by five students at the University of Technology in Sydney, Australia: De Yong “Tim” Quah, Chloe Olivia, Julia Murray, Gemma De Maria and Mathias Watson. We found the article a great comprehensive summary of what we are about and are impressed to find students who understand and appreciate what we are about. The study was done on several film festivals and it is a great study on film festivals. It includes some history and the benefits to the industry and the general public. The following is a section from the full study; centered on our mobile media film festival. 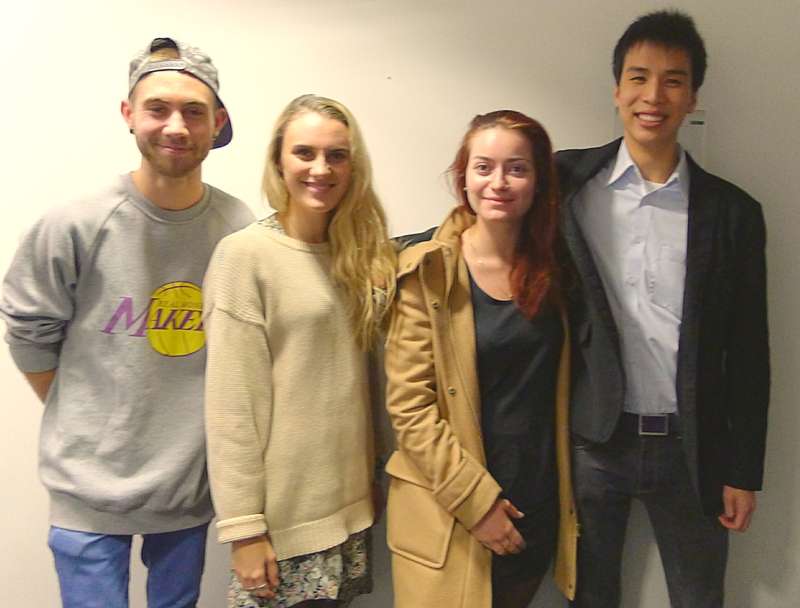 Photo: Left to right – Mathias Watson, Gemma De Maria, Chloe Olivia and De Yong “Tim” Quah. Mobile Film Festival: The Mobile Film Festival (“Mobil Film Festival”) is located in California, USA and organised by S. Botello Productions and sponsored by various other organisations including Grossmont College. The festival aims to lower the cost of entrance into the film industry by ensuring that all submissions to the festival must be filmed on a mobile phone, thereby lowering the cost of production and allowing a greater number of people to participate in the competition. The Mobile Film Festival further promotes entries by not requiring an entrance or participationfee. The rules of the competition it self are few and rather simple. The no copyrighted material rule protects the Mobile Film Festival and producer of the film from legal action against breach of copyrights, which means no need for legal worries. The reason for the minimal rules and regulation of the Mobile Film Festival is because the organisers feel that they do not wish to limit creativity and artistic expression. Apart from the rule that all submissions must be made using a cell phone camera, they also do not accept any work that is vulgar. The goal of the Mobile Film Festival is to network filmmakers with professional sponsors, lower the cost of entrance into the film industry and to create and promote interest in creating films. They lower the cost of entrance into the film industry by making their festival mobile phone focused, therefore people who are unable to obtain a normal camera or expansive enthusiast video cameras can still participate in the festival and stand a chance to be noticed by the industry. The festival helps to create and promote interest in the film industry by hosting a program that inspires and engages children and teens from ages 0-17 to undertake filmmaking. Of the three film festivals in this case study, this one is by far the most different. While all three are online film festivals, the founder of the festival, Susan Botello, confirms that the Mobile Film Festival is not an online film festival because a physical screening location is still very important to them. However this festival does portray characteristics of online film festivals as people limited by geographical restrictions can still participate in this competition, just like any other online film festival. Case and point would be the winners of the 2013 competition, Timothee Corteggiani and Nathalie Giraud from France, with their film “The Girl with the Red Balloon”. This festival can also be analysed using the innovation model for analysing creative industries. The innovation model considers the creative industry to be an innovation system that drives change in the whole economy (Potts & Cunningham 2008). This model holds true for the Mobile Film Festival as the concept of restricting entries to films shot on mobile phones can be examined as forcing filmmakers to be more creative in their work, as well as to consider and embrace new media technology when creating films.